240 Weatherby ammo was designed in the late 1960s by Roy Weatherby. The cartridge is a proprietary round for Weatherby’s classic rifles. The 240 Weatherby is one of the fastest and most powerful 6mm rounds out there. Like most Weatherby cartridges the round pushes the limits of what the 6mm bullet can do. The round is an extremely flat shooting round and very accurate when fired from the fine tuned Weatherby rifles. The 240 Weatherby features sharp recoil, and an extremely concussion for a medium game round. The 240 Weatherby excels at hunting medium, light skinned animals at intermediate ranges. Although the 240 Weatherby is capable of taking larger deer species like Elk. The 87 grain loads are softer handling cartridges designed for varmint and predator hunting, and are perfect for taking coyote. The 240 Weatherby in it’s heaviest loadings are still capable of exceeding 3,000 feet per second, and the lighter varmint loads can reach a blistering 3,800 feet per second. Inside of it’s boundaries the 240 Weatherby is an extremely capable killer, and dominates the medium cartridge market. The 240 Weatherby packs quite the punch for it’s small size, and it’s exceptionally accuracy and flat shooting nature make it a natural plains hunting round. 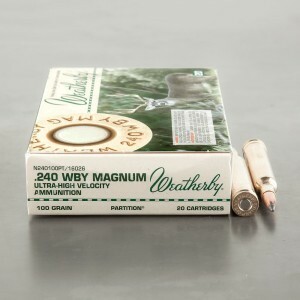 The 240 Weatherby is an unusual cartridge who’s performance speaks for itself. I can hit a quarter with every shot at 150 yds. I have my scope set at 200 yds, It is incredible flat shooting.